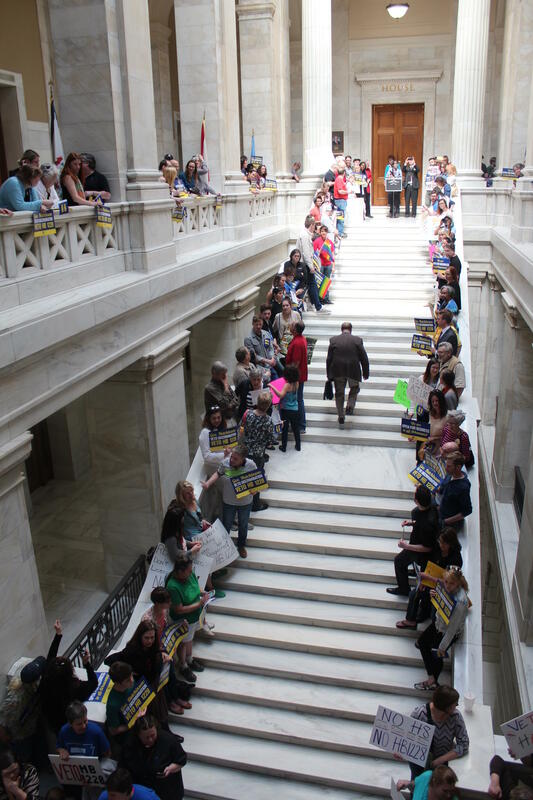 HB1228 opponents organized by the Human Rights Campaign line the steps inside the Arkansas state capitol as house members enter Monday. The Arkansas Legislature approved a bill Tuesday that would heighten judicial scrutiny in cases involving sincerely held religious beliefs. Opponents of HB1228 say it legalizes discrimination and will be used particularly against lesbian, gay, bisexual, and transgendered people. Following the passage of a religious freedom law in Indiana last week, business leaders with interests in that state and in Arkansas have spoken out against the laws, which extend strict scrutiny standards to religious beliefs in cases involving private companies. KUAR’s Sarah Whites-Koditschek spoke with University of Arkansas at Little Rock law professor John DiPippa who said state level RFRA laws are a response to a 1997 U.S. Supreme Court ruling that limited an existing RFRA to the federal level.